By “system” here, I mean the fact my mom doesn’t eat “weird spices,” my sister hates onions, and my brother is the king of backhanded food compliments. I also mean using all the items in your refrigerator before you have to throw them away. Recipes at the bottom of the article. After thinking about it for a quick minute, I swung by the store (one guess which store…*cough* Publix *cough*) and grabbed the rest of the things I needed to make a Mediterranean/Middle Eastern inspired hodge podge of rich flavors that didn’t venture into “weird” territory. 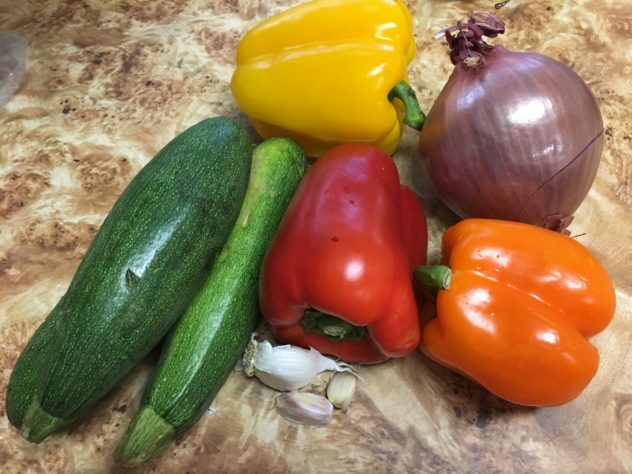 The zucchini, yellow pepper, garlic, and onion were already kicking around. I just rounded out the color palette. The easy part was the kebab. 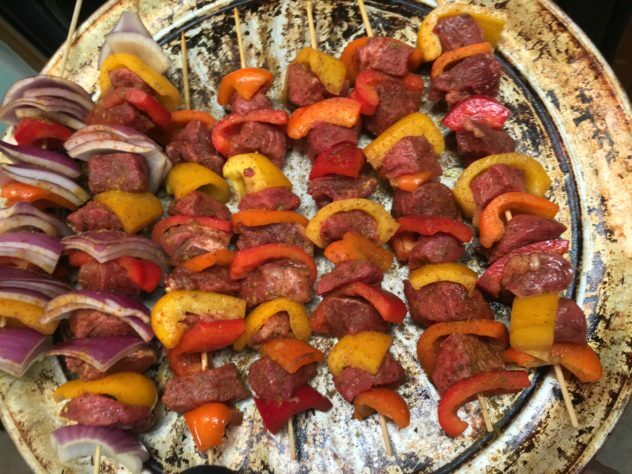 I found a bomb piece of beef in the Greenwise section at Publix and envisioned the yellow pepper and the onion along with an orange and a red pepper on skewers. Well, I would have to make a couple onion-free skewers, of course. What to do with the spice situation, though? Is coriander “weird?” What about cumin? Curry powder? What is a weird, spice, Mom!? Tell me! I settled on “no” to all three of those being weird and went with the philosophy of “asking forgiveness over permission.” I added a dose of, “If you don’t like it, pick it off,” to cover the onion problem. Finally, I dropped in a dash of, “If you don’t want to eat this, make a sandwich.” This is how I treat my stressed mother? I am a monster. Or maybe I just knew it would be fine, and I’d just tell her to trust me and she would. Now what to do with the zucchini? Putting it on the skewer would be boring. It would be nice and green, but so would the spring mix. 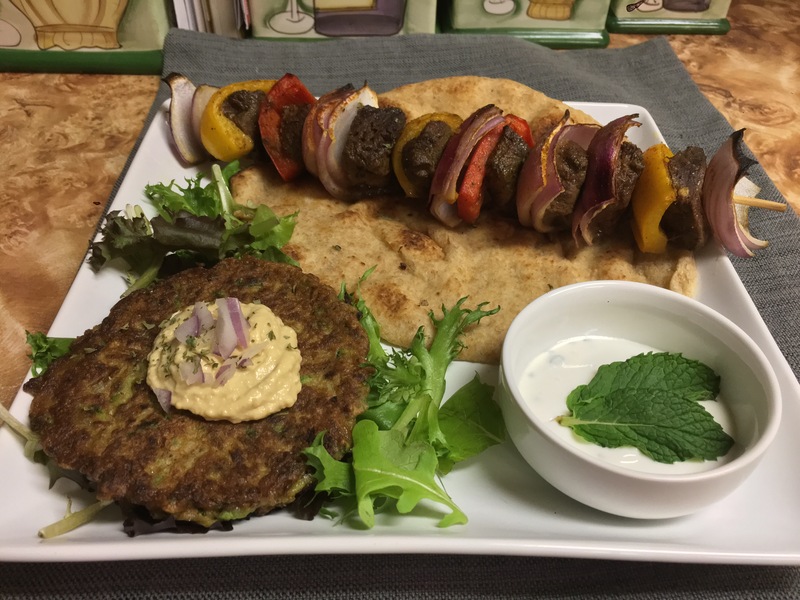 My initial plan was to make za’atar spiced zucchini slices in the broiler next to the kebabs. Then I ran into two problems. 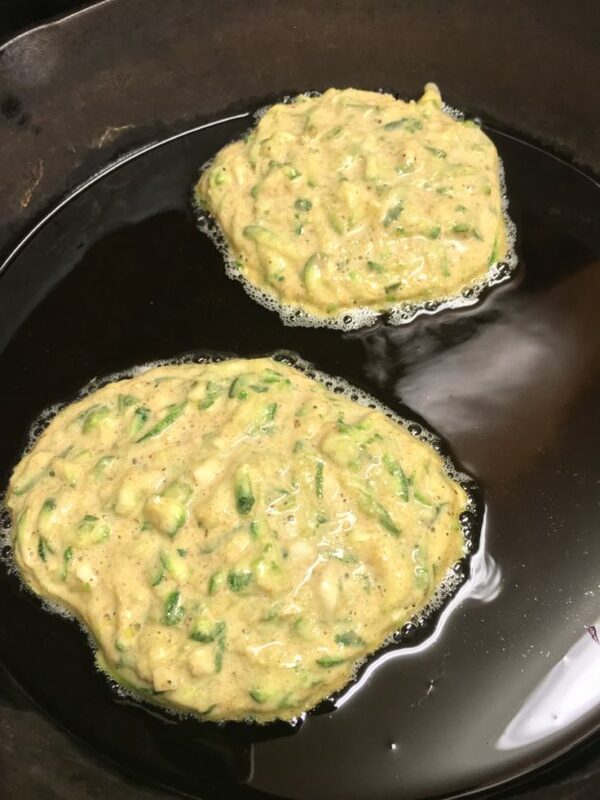 Somewhere on the drive home, I shouted “zucchini fritters!” into the cab of the car and that was that. Now that the menu was in place, it was time to get to it. It was overall an uneventful night, but I did have to play a little “complaint goalie” along the way. Complaint goalie consists of deflecting, blocking, or otherwise eliminating concerns as people move in and out of the kitchen during cooking. It’s become part of the process when I cook for them. On the other hand, my sister is my hype man. I can always count on her to be a fan of whatever I cook and to be an unbridled cheerleader throughout the experience and after. She may not eat onions, but she appreciates just about everything else. I don’t thank her enough. The end result was quite beautiful and exactly what I wanted in terms of richness of flavors. Everyone approved, despite the earlier volley of shots. Mom declared it “weird but delicious.” My brother’s backhanded approval was more direct than usual, “I didn’t know you knew anything about Middle Eastern or Mediterranean cooking, but it seems like you made it work.” My sister even proclaimed, “This can go on the list,” which means, “Please make this again any time you want.” I’m not 100% sure it would turn out the same, but I’m down for trying. If you plan to do this all at the same time like I did, I recommend reading through everything thoroughly first in order to plan. Otherwise, you get all kinds of badly timed things that are cold or not cooked or not prepped properly. Trust me on this if you trust me on nothing else. Turn on the broiler. Alternatively, you can preheat the oven to 350, bake them, and finish by broiling. Your choice. Depends on how you like your meat (that’s what she said?). In a small bowl, combine olive oil, cumin, coriander, curry powder, sea salt, and pepper. Whisk or mix thoroughly to create a spiced oil mixture. In a large mixing bowl (large enough to stir these big chunks comfortably), combine peppers, onion (or in my case, leave these out for now and add to the spices after making a couple onion-less skewers), and beef. Pour spiced oil mixture over the meat and veg and toss, coating generously with spiced oil. Place to the side while you work on something else for a bit (about 20 minutes). 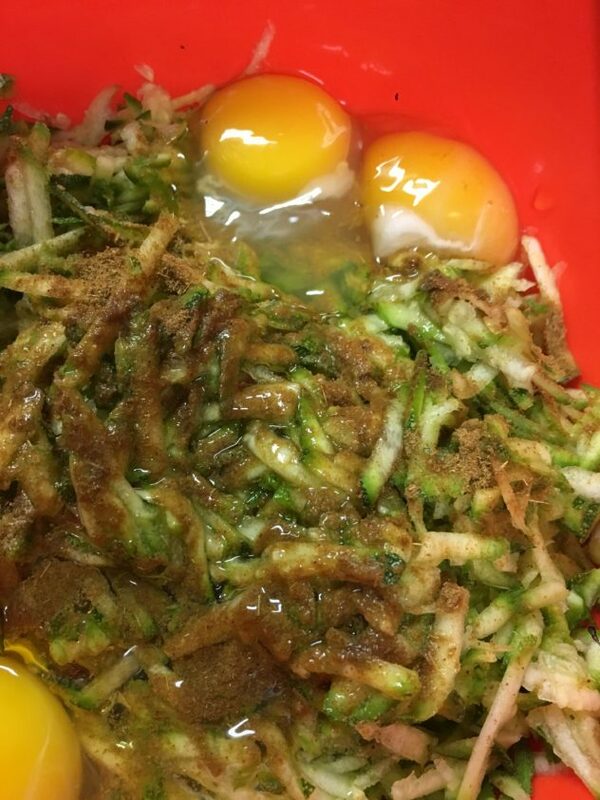 You want the flavors to blend and sink into the meat, but you do not want to marinate it. Thread your skewers (pro tip: If you use wooden skewers, soak them in water for about a half hour before using them. It keeps them from drying out in the oven and makes the food slide off more easily). Alternate the items for maximum flavor distribution. Use a spatula to drizzle the remaining oil and spice mixture over the threaded skewers before putting them in the oven. If you choose to broil them, put them into the oven on a cookie sheet or other large pan under the broiler for about 8 minutes, turning occasionally. If you choose to slowly bake before broiling, place the skewers on a pan or cookie sheet, stick them in the oven for about 20-25 minutes, stare longingly through the front door of your oven, occasionally touch the glass, softly sing a couple bars of “You Light Up My Life,” and take several big whiffs of the fragrant air. Then give the veggies and meat a bit of a charred look by broiling at the end for about 5 minutes. 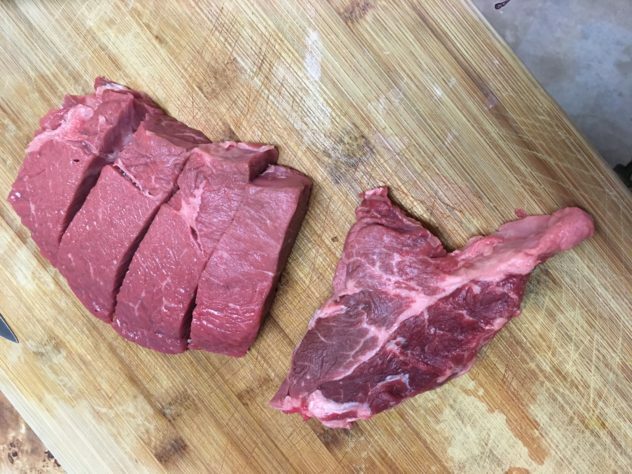 If you use this method, be very careful about how long you cook the meat. 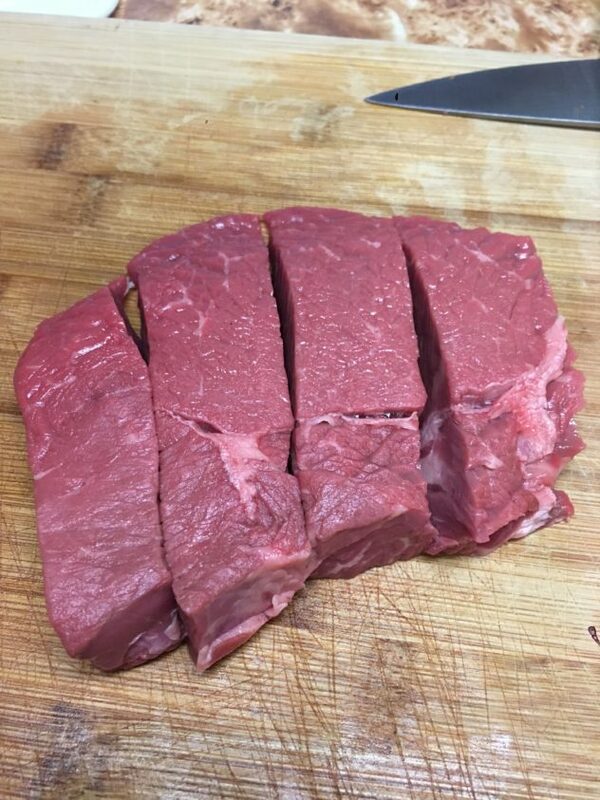 You don’t want to cook it completely via baking or you’ll end up with overcooked, tough meat when you broil-finish it. Check it and remove when it’s still just a bit undercooked to your liking. Then broil. Neither method is really superior to the other. They’re just options. I went with the bake and then broil approach this time, taking the skewers out quite early and placing them to the side while I cooked the fritters. When the fritters were close to done, I threw the skewers back in the oven to finish under the broiler. This ensured they were hot when they were served. You can make this ahead of the rest of these shenanigans, and it’ll keep in the fridge until you’re ready. I like it cold, too, so that’s how I handled it. Mix all this together. Taste and adjust the lemon, mint, and honey to your preference. I don’t like an overly tart sauce, but if you do, you can cut back on the honey. Don’t overdo it on the mint leaves. Warm pitas or naan (we did naan because it was there) right before serving. 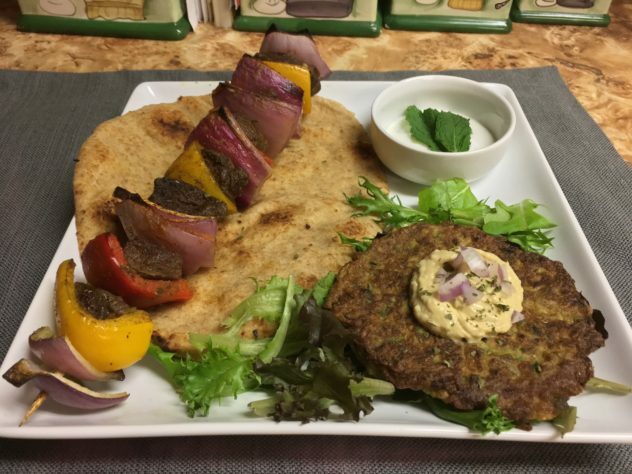 Top naan or pita with spring mix, empty a skewer onto the bread, top with yogurt sauce, wrap, and enjoy. Add sauce as needed. 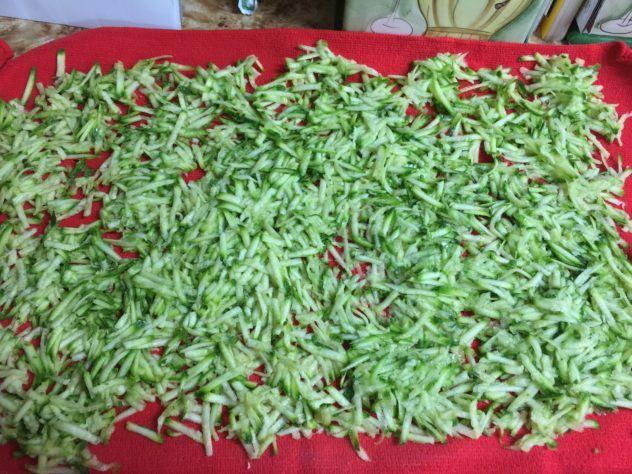 LONG before you do anything else here, shred and dry the zucchini. The pulp should be as free from liquid as possible. Use a tea towel and spread the zucchini evenly. Squeeze excess liquid from the pulp and then walk away for a while. Do something else. In a large bowl, use a wooden or plastic spoon to mix all ingredients except oil. 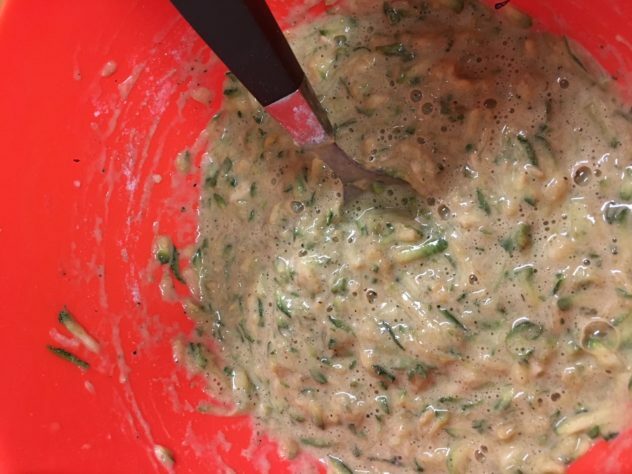 You should mix until thoroughly blended, and if needed, adjust the flour or egg. The idea is to create a batter that holds together well, is relatively thick, but does not become stiff. This needs a bit more flour. See how it appears liquidy? There’s too much egg. Over medium-high, heat oil in a nonstick pan. Using a cup or spoon based on how large you’d like your fritters (I went with a 1/3 cup measuring cup), dip out some batter and drop into the hot oil. Let them cook. Do not be tempted to flip them more than once. This is much like a pancake, and if you flip too soon, you’ll either get a hot batter and oil bath, or your fritters won’t retain their shape. Wait until the bottoms are brown and the edges are cooked so you can cleanly and easily flip the fritter. Once both sides are a crisp, dark golden brown, place them on a paper towel lined plate to absorb excess grease. You’ll also want to keep them warm while you finish cooking them. Since the oven is likely occupied by kebabs, I find sticking them in a closed microwave without turning it on retains most of the heat. On the other hand, if you’re not making them with kebabs and the oven is free, you can plop them in there on warm while you finish. Note an absence of onions here and in the photos of the bowl above. Before mixing the onion into the batter, I made two fritters for the sister without the offending vegetable. 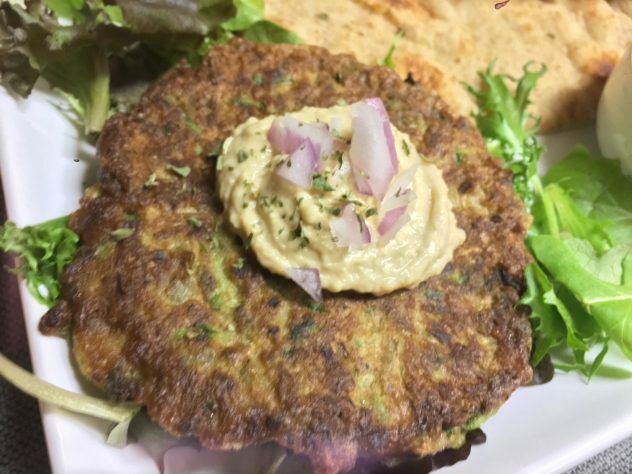 Top a fritter with a dollop of hummus (plain is ideal since there’s a lot of flavor in the fritter), a slice of tomato, and/or a few diced onions. The yogurt sauce or a tzatziki sauce would be equally as good here. This photo only looks out of focus. That eerie, ethereal purple glow and mild blur are actually steam. It’s a fascinating but bothersome phenomenon. There’s a lot of wiggle room with both of these recipes. You can adjust the spices, change the veggies, use butternut squash for the fritters, top things with different sauces, and so on. If you make any of this, let me know how you tailor it to your tastes.